The materials employed by the upholsterer for covering included all those produced by the loom and any other which could possibly be pressed into service for such a purpose, in addition, of course, to leather; while the deft needle of the embroideress was frequently set going for the beautification of such pieces as those illustrated. This was the case, indeed, with Fig. i, Plate I. This fine old double seat is the property of Mrs, J. Seymour Lucas—whose brush work has been so constant a delight to all of us—and, in its present condition, has some interesting associations. When it was first secured by its gifted possessor, the covering of old English needlework was in a condition that might have been deemed altogether hopeless; but H.R.H. Princess Louise, upon examining it, saw the possibility of its restoration, and displayed her keen interest in all that appertains to the art of the needle by undertaking to have the work carried through successfully. The result is a triumph of stitchery, and is naturally treasured by Mrs. Lucas as a practical and tangible proof of the great and cultured encouragement accorded by Her Royal Highness to the cultivation of the applied arts in this country. 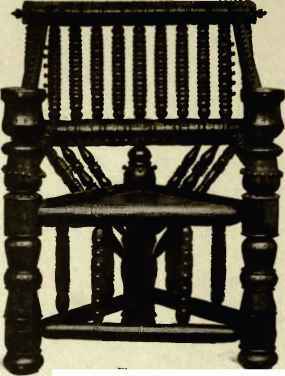 Another seat of a similar character, but of an earlier type, and one in which upholstery does not play so prominent a part, is shown in Fig. i, Plate V.. Here, the " stuffing" has not yet reached the arms, which are of that curious form suggestive of a bird's neck and head, sometimes encountered in chairs of this period, but which can scarcely be described as graceful. 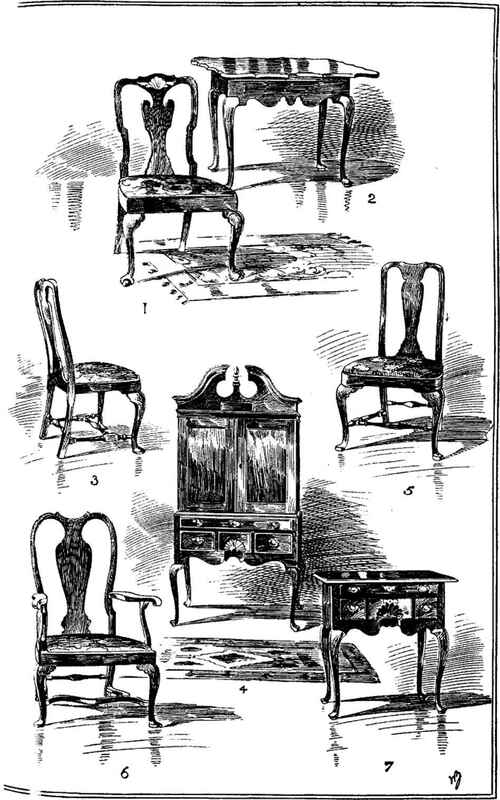 At this time, too, as an alternative to upholstery, cane, being less expensive, came largely into use in the seats and backs of chairs, as represented in Fig. 3, Plate I., in which we have yet another variation of the " Queen-Anne " back.